What could be the Freightliner trucks in 2032? The company Freightliner is holding again the contest on a truck of the future. One of the projects is the DIRU truck presented by designer Luis Cordoba. 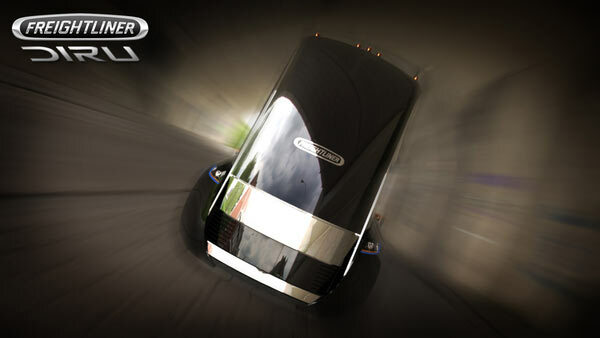 So, what will be the Freightliner of 2032 according to the designer's idea? Firstly, there will be no bonneted layout and horrible aerodynamics. The new truck will have cabover layout with the minimum drag coefficient. Secondly, there are no hungry internal combustion engines anymore. The new truck will be powered by eight electric motors, built-in wheels of the tractor and trailer. Also the designer proposes to use unique tires with high wear resistance. So what is the American in this truck? Probably it is only a great sleeping compartment, an entire room.